Self forgiveness is the lesson learned over a diet slip-up. As we begin the New Year with resolutions of “no more sugar,” “extra low fat,” “vegan all the way,” it can be especially frustrating to not even be to February and have already lost yourself in a decadent chocolate cake or a pile of fries. This is the moment of truth. The Law of Attraction tells us that “like attracts like” on a level of feeling (energy). A diet slip-up can cause feelings of guilt, self-loathing and powerlessness. What do those attract??? Yes, more instances of temptation where you are more likely to give in a second time. A new model of this pattern could be forgiveness. When you have finished the carton of ice cream, rather than write a mental story about how you have zero self-control, what if you simply forgave yourself? You let it go, be what it was. Savor the deliciousness and move on. It is so much better to eat healthy 95% of the time with 5% slip-ups than to give up and let the goal go. By being kind with yourself and the situation you are in, you attract more feelings of love and appreciation which is a motivator in itself to improve your health. On Saturday, I had a donut. It was phenomenal. I enjoyed every moment of fried dough complete with frosting and sprinkles. For lunch that day I had an avocado sandwich with tomatoes & sprouts on whole grain bread. No guilt, no give in, no pizza. Once I realized that I could just let my slip-ups be moments instead of stories about how I have no self-control, I began realizing that I was eating healthy and eating vegan much more frequently. 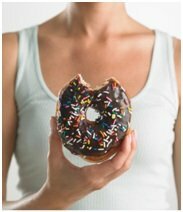 It can also help to plan ahead and beat cravings at their own game. Here is a recipe for vegan macaroni and cheese that is simply amazing. I anticipated that at some point I was going to crave cheesy goodness and this did the trick. Enjoy!